The Gesneriad Society is an all-volunteer nonprofit corporation chartered by the State of Missouri and functioning internationally. We are a group of over 1,000 people from all over the world, sharing an interest in the cultivation and botany of gesneriads. The Society has chapters in the USA, Canada, and Sweden. Founded in 1951 as The American Gloxinia Society, an association devoted to the growing and propagation of Florist Gloxinias (Sinningia speciosa) and other gesneriads, our name was changed in 1966 to The American Gloxinia and Gesneriad Society, then simplified in 2006 to The Gesneriad Society to better reflect who we are. Our Journal, founded in 1951 as THE GLOXINIAN, is now called Gesneriads. Receive Gesneriads, the Journal for Gesneriad Growers. Excerpts are available. Access back issues of Gesneriads, available only to members in high-quality, searchable PDF format. 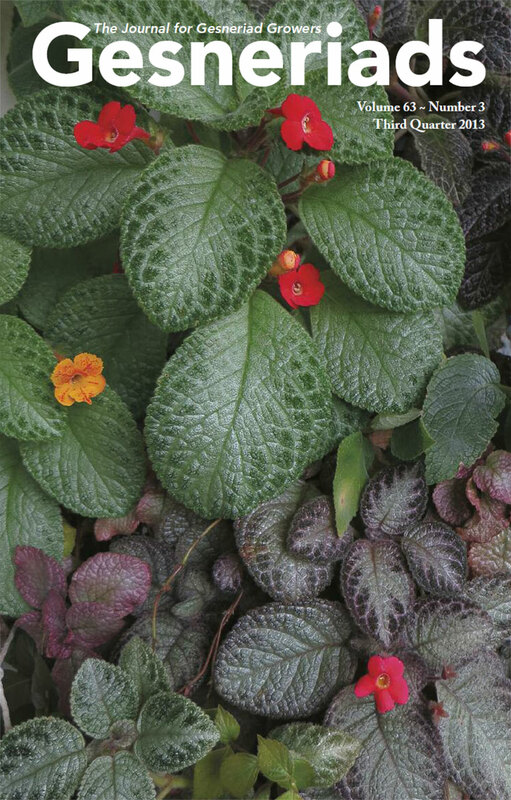 Attend the annual Convention, with meetings, lectures, tours, a flower show and plant sales, and the opportunity to meet other gesneriad enthusiasts from all over the globe. Access to listings, descriptions, and illustrations of newly registered gesneriad hybrids in the Journal. (Gesneriad registers, or listings of all the named varieties within a genus, are published separately at intervals). CDs and DVDs covering a range of topics on the growing, showing, and botany of gesneriads are available for purchase at a nominal cost. Gesneriad Society members and those who are just visiting here are encouraged to attend a meeting of a Gesneriad Society chapter near them. Chapters are currently found throughout North America and in Sweden. Chapters have regular meetings, flower shows, plant exchanges, programs, workshops, auctions, raffles, and educational projects and provide opportunities to socialize with other gesneriad growers. Every Gesneriad Society Convention includes a show. Local chapters may hold an Annual Show as well as more frequent Little Shows. A Gesneriad Show provides educational opportunities for both exhibitors and judges, of all skill levels. A Gesneriad show includes divisions for Horticulture, the Arts, and Educational and Commercial exhibits. The Gesneriad Society uses standard competitive judging (one first, one second, and one third award per class) because it is our belief that this judging method encourages exhibitors to constantly improve the culture and presentation of the gesneriads they grow and exhibit. A plant sale is usually held in conjunction with a show. Visit the Events page for a list of upcoming shows and sales.